Fonts are very subjective topic for most people, and it's hard to separate out functionality from asthetics. This of course becomes more important when considering body copy, where the font has a big job in supporting the readability of the content, while also trying to convey the tone of the site. Once upon a time (i.e. before web fonts) we used to have a very limited choice, so choosing a suitable font was much easier than it is today with the huge and ever-expanding range of free and paid-for web fonts. One way to get past paralysis in the face of overwhelming choice in terms of fonts is to consider what everyone else uses. Because I don't have the time to cast a net across the entire web, I've decided to have a look at the font choices of the top 15 news sites and the top 15 blog sites. There's some overlap between the two categories, so I've also added a small handful of up-and-coming news sites such as Vox and Vice. The chart pictured above can be found here, and the original data here. 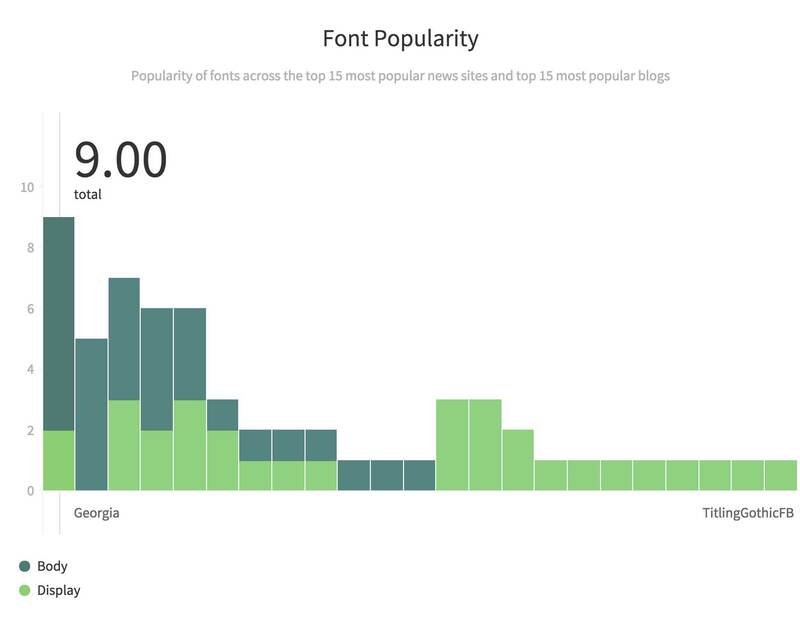 Fonts do wax and wane in terms of popularity (vis-a-vis Proxima Nova), so although popular today (and remember that this survey is only considering 32 sites), a given font may drop in use quickly over time. However, as far as web fonts go, Open Sans and Helvetica Neue both seem to have a lot of momentum (e.g. Helvetica Neue being used as Apple's OS font). Compare TypeWolfs most popular fonts of 2013 with their most popular fonts of 2014 to see how quickly fonts can rise or fall in popularity. MyFonts also have a nice post on the most popular fonts of 2014.